Efficiency in the Clean Power Plan: What are states doing? What should they be doing? We’re currently stuck in Clean Power Plan limbo. The EPA’s comment submission deadline is behind us, the final rule is ahead of us, and the temptation to act like school’s out for summer is real. While it’s still unclear exactly how states should credit all efficiency measures in their plans, it is clear that states will have an easier time reducing energy waste, diverting carbon pollution, and complying with the Clean Power Plan if they put their thinking caps on now. One way states can dramatically lower the cost of compliance is by including energy efficiency in their compliance plans. ACEEE’s State and Utility Pollution Reduction Calculator helps states understand just how cost effectively energy efficiency can lower emissions. For a couple examples, let’s highlight major energy efficiency opportunities in Illinois and Virginia. Illinois has engaged other Midwestern states through the Midcontinent States Environmental and Energy Regulators stakeholder group, exploring the implications and feasibility of regional Clean Power Plan compliance in non-binding discussions. Within the state’s boundaries, pending legislation could make using energy efficiency as a compliance mechanism easier. Illinois should be commended for its proactive 2% annual energy savings target in 2015. However, a cap on spending has impeded the state’s realization of this target, and a recent proposal by Governor Rauner to re-route a portion of ratepayer dollars earmarked for low-income efficiency programs into the state’s general fund will make achieving those goals even more difficult. If Illinois commits to achieving 2% electricity savings annually through 2030, it would divert 43 million tons of CO2 in 2030. Another opportunity for growth is in the state’s combined heat and power (CHP) programs, for which Illinois has strong market favorability. 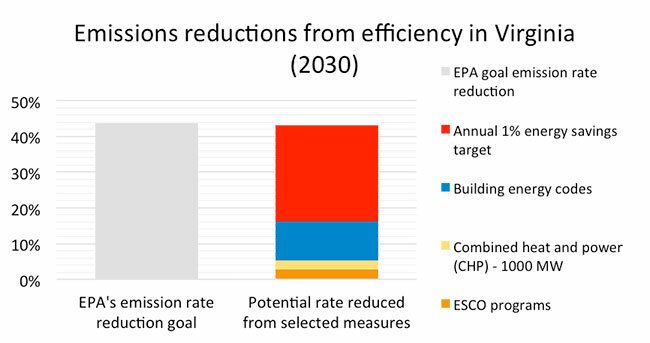 If the state installed 2,500 MW of CHP—half of its technical potential —it would reduce 12 million tons of CO2 in 2030. 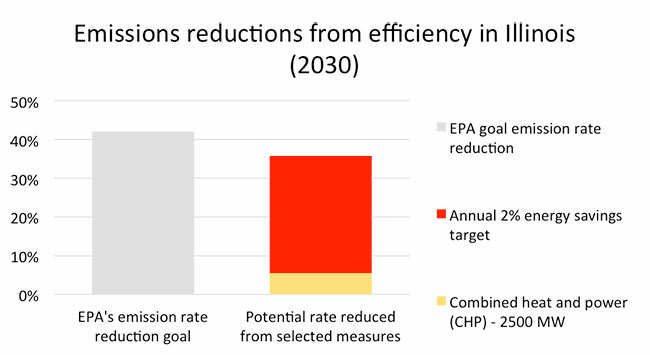 Together, the savings target and the CHP deployment, displayed in the chart below, would allow Illinois to achieve an incredible 85% of its Clean Power Plan target! Governor Terry McAuliffe has demonstrated leadership in Virginia by appointing a chief energy efficiency officer and appointing the Executive Committee on Energy Efficiency, which met for the first time on June 1st. Governor McAuliffe’s public support for the Clean Power Plan should be commended, but it is important for the state to quickly shift into gear to meet its target. Virginia could capture the momentum of the governor's efforts to reduce energy consumption in state buildings, and educate municipalities and counties about energy performance contracting. The state could designate a state agency to help implement energy service performance contracts (ESPCs), or offer financial incentives for agencies seeking to use ESPCs, avoiding over 2 million tons of CO2 in 2030. The state could also adopt the latest IECC and ASHRAE building energy codes, regularly adopting new codes every three years through 2030, to reduce its CO 2 emissions in 2030 by almost 7 million tons. Virginia also has room for growth in its deployment of CHP technology. Another huge opportunity in Virginia is an energy savings target. The state has a voluntary 10% savings goal by 2022, as written inlegislation, or by 2020, as accelerated by Governor McAuliffe. However, Virginia is behind on efforts to reach this goal. By achieving 1% electricity savings annually through 2030, Virginia could avoid over 10 million tons of CO2 in 2030. As the icing on the cake, if Virginia installed 1,000 MW of CHP, divided evenly between the commercial and industrial sectors, it could divert over half a million tons of CO2 in 2030. As seen in the table below, this suite of programs would get Virginia 99% of the way towards its Clean Power Plan target—an A+ approach if there ever was one. How else can states prepare? Identify existing energy efficiency programs that could be used to meet emission performance levels . This will help states understand how to play to their own strengths. Begin forecasting the carbon pollution reduction potential of efficiency policies . ACEEE’s State and Utility Pollution Reduction (SUPR) calculator can do just that. In order to help states understand how to incorporate efficiency into their compliance plans, ACEEE is working on a series of guidance documents for states as they put pen to paper. ACEEE recently released templates for states’ inclusion of building codes, energy efficiency financing programs, and combined heat and power in their plans. With such a flexible syllabus from EPA, states truly have the power to chart their own path to success. Let ACEEE know how we can help! Please contact Mary Shoemaker (mshoemaker@aceee.org) with inquiries.